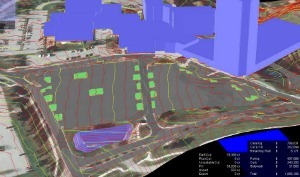 Prince-Lund Engineering, PLC uses Siteops, a design and cost optimization software tool, to show you better options for real estate development. Play the video to see how Prince-Lund Engineering can take a plain real estate development concept and give it real power. Why Is Designing with SiteOps Better? The feasibility of a physical location of your development project means nothing without costs. Prince Engineering provides you with reliable, bankable cost estimates on properties so that you can make better decisions faster. In hours instead of days. Days instead of weeks. Are you looking at the best location for your development? After you have selected alternative areas based on traffic, neighborhood, competition and related factors, you can now get real costs for the physical improvements to specific parcels as fast as you need to make decisions. One of the nicest features of our work is that you can consider very marginal sites for the feasibility of development. What do we mean when we say marginal? Steep slopes, wetlands, easements, restrictive zoning and other obstacles on an otherwise great location are analyzed quickly with your development idea to determine its feasibility and help you find a gem of a property where others only see problems. We provide you with real costs to support your insight and experience. How would you like to see 3D visual models of multiple layouts on multiple sites, with detailed construction cost estimates? In days instead of weeks? Without blowing your engineering budget? Our methods provide quick-turnaround cost projections of all property improvements. We provide you with knowledge about the financial feasibility of a property to support your development idea. Even without an initial survey. With Prince-Lund Engineering, you have the advantage of cutting edge land development software and decades of tried-and-true, dependable civil engineering experience at your command. Fax us a sketch. You can get results on a site concept in hours instead of days. With costs. You decide if a site is a go or no-go. 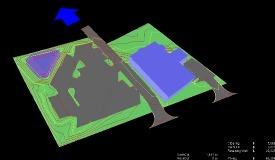 We develop a site concept into a 3D model using cost optimization to provide the least cost development plan based on millions of iterations of grading, storm water, and layout requirements. All costs of land development including earthwork, pavement, sidewalk, and utilities are included in your report. After Siteops is finished with your development concept, we have linework in electronic format that gives you a 35% complete drawing package. Again -- in days instead of weeks. We use that linework to export into Carlson and AutoCAD drafting software to produce the hard copies you need for agency submittals and then to construction drawings. That's not all. We at Prince-Lund Engineering use the dynamic 3D power of Siteops with Google Sketchup to produce quality visual presentation materials. It's a collaborative effort of software and smarts (the software makes us look smarter). Did we say days instead of weeks or months? Hours instead of days? That transfers into savings for you. No traditional design firm would touch a product that cuts their hours on a project. Prince-Lund Engineering uses great, time saving tools. We look for and use the latest and best tools to make our products work for you as quick and efficient as we can. If you're a land developer or work with one, you'll be surprised at what Prince-Lund Engineering with Siteops in hand can do for you. Take a look. Give us a call or email us (this takes you to the contact form). We're Inclusive, not Exclusive. You'll enjoy what you can build with Prince-Lund.